Santa Eulàlia high school in Terrassa has collaborated again on knowledge tasks of the Terrassa day-to-day initiating a new survey on perceptions of citizenship and on different topics of interest including: the image of the city, the state of the economy, water management, attention to municipal media. One of the eleven questions was about Smart City technologies.This is the 3rd time that this educational community extend his cooperation to the municipality of Terrassa in tasks of statistical survey, performance that has received technical advice and methodological support of the Observatori Econòmic i Social i de la Sostenibilitat de Terrassa (OESST ). This survey was conducted in April and May 2016 by 250 students who enter into the knowledge of the city and its people, asking questions, practicing math, out in the streets to ask people randomly and analyzing the results. It is a very interesting exercise at an education level which is a way to know the opinion of a sample of 2,231 people with a sampling error of ± 2.062% for a results confidence level of 95.5%. 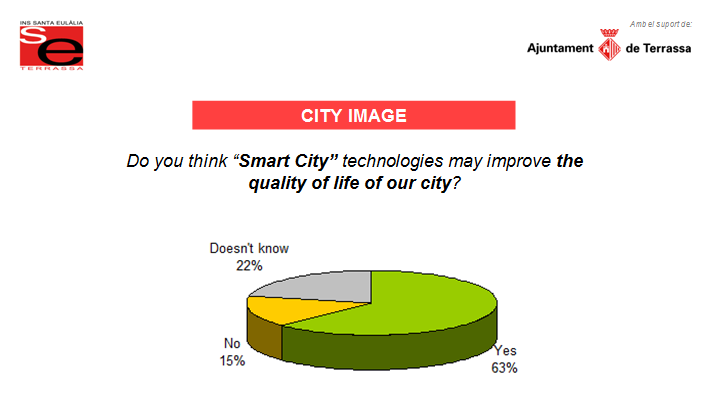 To the question if the “Smart City” technologies are a factor to achieve improvements in the quality of city life: 62.8% thinks so, 21.8% say they do not know or do not have it clear, and only 15.4% do not believe in the ability of technology to improve the quality of life in Terrassa. This perception of citizenship is an interesting indicator for Smart City Director Plan of Terrassa. It must take into account these sensitivities in new implementations and project progress, communicating and clearly showing the challenges and benefits in quality of life that are setting and achieving. In this sense it can be observed the importance of modulate information taking into account more techno skeptical citizens. Surely the critical view of these public can help further improve the approaches and initial prototypes providing them with more security and “citizen sense”.